The Biblical Flood is an event (Date::17 Bul 1656 AM) described in the Biblical book of Genesis, wherein the entire world was covered with water as a deliberate act of God. Only a small number of humans and animals survived through an ark that was built by Noah under instructions from God. The account in Genesis is the best known and the most detailed, but the event recorded in ancient histories in various forms across cultures worldwide. It is described in the Islamic Qur'an, the Book of Jubilees, and the Book of Enoch. Direct references occur in the Critias and Timaeus of Plato, and the ancient Babylonian Epic of Gilgamesh. 2.4 Foreshadowing of the "Rapture"
6.1 Where did the water come from? 6.2 Where did the water go? 6.3 Was the flood regional? 6.4 Could a just God destroy innocent life? 6.5 How could you get 7 billion people from just 8 survivors of the Flood? 6.6 Could plants survive the pressure and salinity? 6.7 Could the Ark hold all the animals? 6.8 Could Noah repopulate the earth with the altered soil composition and available food? 6.9 Would inbreeding threaten extinction for humans and lower animals? According to the Biblical account, the Flood of Noah initiated when the "fountains of the great deep broken up" (Genesis 7:11). Thus the primary source of water was subterranean. This was accompanied by "the windows of heaven were opened" to deliver a forty day rain. The waters rose and persisted for some time after the rain subsided. Since the hydrologic cycle of this timeframe was not air-to-ground-to-air (clouds and rain), but underground-to-ground-to-underground (a ground-level mist), there is no identifiable earthly source of water for the "windows of heaven" There were no clouds or rain, but a mist that watered the earth (Genesis 2:5-6). In fact, in other places where "windows of heaven" are mentioned (2 Kings 7:19, Isaiah 24:18, Malachi 3:10) this term reflects a provision directly from the heavenly realm. The Bible is not clear on when the "springs of the deep" were closed and some have interpreted Genesis 7:24 to mean that 150 days were involved - wherein it states: The waters flooded the earth for a hundred and fifty days.. The flood, which began in the 600th year of Noah's life on the 17th day of the second month (Genesis 7:11 ) - to the day when the ark came to rest in the mountains of Ararat on the 17th day of the seventh month (Genesis 8:3-4 ). Noah was unable to leave the Ark for quite some time after this, however, because the tops of the mountains were not seen until three months later (Genesis 8:5 ). Noah was not given permission to leave the ark until the 27th day of the second month of his six-hundred-first year, placing them in the Ark for over one year(Genesis 8:14 ). In this timeframe, we can derive that a month was thirty days long, with twelve months for a 360-day year. Even today, the value of 360 is used to measure a circle. Like a seven-day week, we may presume that this is a holdover from a pre-Flood measurement standard (one degree being one day) because no other known astronomical or geographical standard would provide such a baseline. Several theories have been put forth to explain the source and eventual recession of these waters. While early models held to the existence of a vapor canopy as supplying the flood waters, the majority of creation geologists now support the waters from beneath the Earth's crust as responsible. Supporting this long-held view, subterranean water reservoirs have been recently discovered revealing oceanic-level water quantities below the Earth's crust. The exact depth of this water within the Earth's crust varies with different models. The Hydroplate theory places the water below a 10 mile thick crust, the remnants of which are now the continental crust. The Hydroplate theory is the first flood model to deal with the springs of the great deep. Modeling the springs of the deep is an important aspect of any Flood model and one where hydroplate theory excels. It is an important aspect of flood geology but one that still requires much work. God chose a specific class of creature to annihilate, that is all creatures with the breath of life Genesis 6:17 Genesis 7:22 with a specific complaint that their flesh had been corrupted Genesis 6:11-13, , but more importantly, they had "corrupted their way upon the earth". This is a direct allusion to the "way" of the flesh, which is the behavior borne on its corruption. The Creation had strongly deviated from its original design, both in the genetic makeup of the creatures, and the behavior borne on those genetics. According to the book of Genesis 6:9 ,"Noah was a just man and perfect in his generations and Noah walked with God". However, Noah lived at a time when men became more and more corrupt, and God determined to rid the Earth of its population. Because of Noah's special place as a (a) righteous man (b) near genetically pristine and (c) walked with God, God entered into a covenant with him, with a promise of deliverance from the impending Deluge. He was accordingly commanded to build an ark to save himself and his family. God told Noah that he would send animals to the Ark. Noah would not have to gather them. An important aspect of the Flood is that God chose the passengers of the Ark based primarily on their genetic viability (to abate the corruption of the flesh) and in Noah's case, someone who would be obedient to build the Ark and apply extraordinary physical and mental effort to accomplish it. We must consider that God declared the entire world wicked, including Noah, yet set Noah aside for this task. Certainly Noah's heart was no better than any other man, but God recognized his dedication to truth and to God himself, as well as his genetic viability for the post-Flood world. It is seen as significant by most that the Bible mentions a hybrid race known as the Nephilim immediately prior to God's proclamation to destroy the Earth by flood. Their presence may have been responsible for or contributed to the corruption of humankind. Being the progeny of God's enemies (fallen angels), they may also have contributed to the continuing rise of violence, jeopardizing the future of the human race as a whole. However, the primary purpose of the Flood was not to simply destroy or punish the wicked (e.g. a vindictive act as promulgated by atheists), because after the Flood we read in the Bible Genesis 8:21 that the "imagination of man is evil from his youth." The Flood was a very physical solution to a physical problem that was worldwide in scope. Wickedness, violence and evil were the natural results or symptoms of the physical complications. Sin and wickedness are pervasive in the heart of man to this day, even for believers. In this time frame, however, the physical world had taken on a form of corruption that required a physical rather than spiritual solution. The most dramatic outcome of this solution would be to stop the procreation (cut off the descendants) of every line of land-creature than did not board the Ark. We may also presume that this corruption-of-flesh affected clean animals which, if annihilated, would inhibit man from having fellowship with God through sacrifice. Corruption of the flesh explains why animals had to be annihilated along with mankind, because animals do not sin or have moral issues. Ancient historical records (including Genesis) state that prior to the flood of Noah, humans lived to approximately 10 times our current life expectancy. Methuselah is known for living longer than any other human in history, dying at the age of 969. This longevity is believed to be so extraordinarily long in part because environmental conditions were optimal before the Earth was destroyed. However, immediately after the flood, the lifespans recorded in the Biblical genealogy dropped quickly. Creationists have proposed a number of explanations for this, and it can not be overlooked as significant that immediately prior to proclaiming the coming of the global flood, God states that "Man's days shall be 120 years;"(Genesis 6:3 ). This statement may well indicate that one of the purposes of the flood was to reduce the lifespan of humans.. In Genetic Entropy, John Sanford notes that anyone could place the decreasing lifespans from Adam to King David and put them on a curve, and they would represent an exponential decay that is off-tolerance by less than 0.94. Either the Biblical patriarchs were simply recording what they saw, or had access to advanced mathematical models in order to display the curve this way. An exponential decay curve is significant in that, if initiated by God Genesis 6:3 is mathematically consistent with the rest of his Creation. An exponential decay curve (genetic decay resulting in shorter lifespans) has significant implications for the evolutionary model. If for example the human genome is decaying from its originally designed state, this flies in the face of evolutionary claims that the genome is getting better with each generation. In fact, it asserts that the human genome is devolving, not evolving. Invariably when evolutionary thinkers publish papers on recent observations, it is often very easy to reinterpret their conclusions in the light of genetic decay or loss-of-function rather than the other way around. The famous Lenski experiment  attempts to show evolution-in-progress. But each observation, taken out of the evolutionary context, is indicative of loss-of-function not gain-of-function. The word "pitch" used to cover the Ark, Genesis 6:14 is the same word for "atonement" (Strong's H3722) and foreshadows the blood atonement of Christ, which protects the believer from judgment John 3:36 , just as the pitch protected the Ark from the waters of judgment I Peter 3:20 . God's holiness is "active" in that sin compels him to respond. His loving mercy likewise compels him to provide. While the Flood represents the fact that God possesses the will and capacity to execute judgment on creation, it is also representative of God's provision of salvation of the righteous. Abraham persistently inquired of God as to his tolerance of wickedness for the sake of the righteous remnant Genesis 18:32 where Abraham learned that God would withhold judgment for the sake of 10 righteous (Abraham feared inquiring further). The remaining righteous before the Flood (8 people) did not meet this threshold. In the discourse on the Mount of Olives Matthew 24 , Jesus Christ offers insight to a period commonly referred to by believers as the "last days". Interleaved in these explanations are foreshadows of the event that believers call "the Rapture", when Jesus returns in the clouds to receive all believers living and dead. Jesus references Lot and Noah as examples of "evacuation before judgment". But as the days of Noah were, so shall also the coming of the Son of man be. For as in the days that were before the flood they were eating and drinking, marrying and giving in marriage, until the day that Noah entered into the ark, And knew not until the flood came, and took them all away; so shall also the coming of the Son of man be. Then shall two be in the field; the one shall be taken, and the other left. Two women shall be grinding at the mill; the one shall be taken, and the other left. Watch therefore: for ye know not what hour our Lord doth come. And as it was in the days of Noah, so shall it be also in the days of the Son of man. They did eat, they drank, they married wives, they were given in marriage, until the day that Noah entered into the ark, and the flood came, and destroyed them all. Likewise also as it was in the days of Lot; they did eat, they drank, they bought, they sold, they planted, they builded; But the same day that Lot went out of Sodom it rained fire and brimstone from heaven, and destroyed them all. Even thus shall it be in the day when the Son of man is revealed. The above are both a picture of "evacuation before judgment", in describing the Rapture event, that all believers will be caught up (1 Thess 4:17) to be with the Lord in the air as a groom receives a bridge into the bridal chamber (Matt 25:1) for the wedding supper of the Lamb Revelation 19:7-9 . Christ's rich wedding imagery and constant anchoring of the believer to a marriage covenant is a promise of the groom's protection and provision for the bride. Significant in Christ's explanations are the "routine" existence of everyone prior to the Rapture event (likening it to Noah and Sodom in this regard). When we couple this with the extraordinary spiritual and earthly mayhem that start and escalate (Daniel 7,8,9, Revelation), we can see that there is nothing "routine" about two prophets causing worldwide plagues (Revelation 11:3-6), a global emperor causing people to swear fealty before they can do business or buy food (revelation 13:15-17), along with real miracles (angelic hosts preaching to mankind (Rev 14:5,6) and demonic miracles (2 Thess 2:3-9). These lead us to the very objective conclusion that Christ will remove his Bride from the Earth prior to the beginning of this mayhem. Jesus is the "Lamb slain from the foundation of the world" Revelation 13:8 . All of God's actions will ultimately preserve this truth. God had already promised Adam and Eve Genesis 3:15 that Eve's seed would be used to redeem the creation. This is an explicit promise of a human Redeemer, a foreshadowing of Jesus Christ. Adam, Eve and many more died with this promise in their hearts. Human souls are eternal Genesis 2:7 . Many believers, including Adam and Eve, had already died prior to the corruption of the flesh and the rise of violence that so grieved God. Their souls did not go to heaven, but awaited Christ's redemption elsewhere John 3:13 Luke 16:22 I Peter 3:19 Ephesians 4:8-10 Acts 2:27-31 . Without Christ's redemption, they would remain forever separated from God's fellowship. This promise required God to preserve mankind's bloodline in-general to bring about a human Redeemer. God later acts through the Abrahamic promise Genesis 18:18 Genesis 22:18 and the Davidic promise II Samuel 7:16 to preserve specific bloodlines leading to the promised Messiah. As God interacts with mankind using everlasting priorities, The Flood and all of the acts of God, including the acts he required of men, kings and armies, can be viewed from a perspective of eternal purpose rather than temporal utility alone. The pre-Flood violence, if unabated, risked at worst annihilation of all mankind, at best subject to the cruelty of demon progeny in the Nephilim. However, if annihilated, this would nullify the promises that God had already made to mankind to send a human Redeemer (no humans remained through which the Redeemer could come). For those who would have died prior to this annihilation, including Adam and Eve, the salvation through human Redeemer would likewise be lost. Their souls would remain in hell unredeemed and God's promise broken. The Ark is a promise-kept to all future believers, a picture of salvation for the future of mankind, but also the preservation of a promise to those believers who had already died. This viewpoint largely dispels the notion that God was acting capriciously or as a "cosmic kill-joy" to wipe out humans for punishment alone. Preparations for later sacrifice were made in the stocking of the Ark Genesis 7:2 , with seven pairs of clean animals and one pair of unclean animals. As Noah did not have to fetch the animals, (they were sent Genesis 6:20 ) but the overstocking of clean animals underscored God's priority of preserving ongoing fellowship with man in the upcoming generations, through blood sacrifice. The Biblical account of the flood contains a remarkable degree of detail. Precise dimensions are given for the ark and each of its decks. It also provides the exact year, month, and day of the flood. In Genesis 7:11 we read that the flood occurred in the six hundredth year of Noah's life, on the seventeenth day of the second month. According to the Biblical genealogy, this was 1656 years after the creation. This degree of detail — day, month, and year — is common in first-hand historical accounts, but is rare in myths and fiction. According to the Biblical chronology the global flood occurred approximately 4500 years ago. If this event occurred as described in the Bible, the fossil record left behind could never be correctly interpreted by a naturalist. Although the earth is completely covered in monumental amounts of flood sediment, a naturalist would have to explain the survival of animals using natural processes, such as many local floods, and gradual deposition over millions of years. However, the Bible specifically says God caused the earth to be flooded until the waters exceeded the highest mountain by 15 cubits (22.5 feet, or 7 meters) (Genesis 7:20 ). The waters covered the mountains to the extent that no human was capable of surviving without supernatural intervention. The evidence of this event covers the world, but cannot be correctly interpreted by scientists who hold to an atheistic philosophy and naturalistic presuppositions. Native global flood stories are documented as history or legend in almost every region on Earth. In The Antiquities of the Jews, first-century historian Josephus cites myriad ancient histories recording the flood, including those by Berosus the Chaldean, Hieronymus the Egyptian, Mnaseas, and Nicolaus of Damascus. (Antiquities I:3:93-95.) In addition to these written accounts, scores of oral traditions about the flood exist throughout the world even today, including Native American and Aboriginal societies. Old world missionaries reported their amazement at finding remote tribes already possessing legends with tremendous similarities to the Bible's accounts of the worldwide flood. H.S. Bellamy in Moons, Myths and Men estimates that altogether there are over 500 Flood legends worldwide. Ancient civilizations such as (China, Babylonia, Wales, Russia, India, America, Hawaii, Scandinavia, Sumatra, Peru, and Polynesia) all have their own versions of a giant flood. 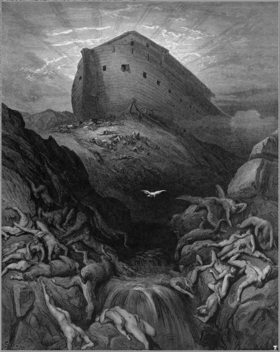 These flood tales are frequently linked by common elements that parallel the Biblical account including the warning of the coming flood, the construction of a boat in advance, the storage of animals, the inclusion of family, and the release of birds to determine if the water level had subsided. The overwhelming consistency among flood legends found in distant parts of the globe indicates they were derived from the same origin (the Bible's record), but oral transcription has changed the details through time. A flood was sent by the divine to punish mankind. A family of people and a number of animals were spared from the flood in a boat. All life on earth outside the boat or not native to the water was destroyed. The residents of the boat repopulated the whole earth. There are two explanations for the widespread flood story. The global flood was a popular and fictional myth created by early man, passed from culture to culture and gradually exaggerated, or global flood was a historical event, of which the events were recorded and retained to varying degrees of accuracy in different cultures over the years. If this was a fictional myth, why did all the cultures take it as historical fact? If this was a fictional myth, why was it found among Native American people who (according to the evolutionary view) had no contact with people of the Middle East for tens of thousands of years? If this was a fictional myth, why is there such a spectacular degree of detail, particularly in the Genesis account, which provides the exact day, month, and year for the events of the flood? Why is the geologic record so much more consistent with catastrophism than with uniformitarianism? Why does the physical evidence such as the massive fossil graveyards, huge sedimentary deposits, vast coal and oil fields and chalk deposits indicate a massive flood so strongly? Many of those who most vigorously object to the second approach (historic event) do so for philosophical reasons. Because the most complete account of the Flood is found in Genesis, any admission of a major flood in human times would present a threat to Naturalism philosophy. They object to the idea that a God of judgment would reveal the future to a human and then destroy almost all land-living animals. Even evolutionists who agree with catastrophism often seek other explanations. This philosophical objection results in a great number of apparently scientific arguments against a global flood. However, most of these arguments are unfounded and do not hold up to scientific scrutiny. Most historical information regarding the pre-flood world and the post-flood world is based largely on speculation. However, one conclusion that is usually agreed upon is that the pre-flood world and post-flood world were dramatically different. The following table is a summary of the known and assumed facts based on scientific research and biblical history. Nutrient Availability Full nutritional diet available in plants and/or other resources. (Genesis 1:9 ) Many creatures, including Man, are now allowed to eat meat because there is a loss of nutrient resources. (Assumption based on Genesis 9:2-4 ) It is clear that before the flood, plant life was ample to sustain man, but after the flood, God also made animals available for man as a food source. Springs of the Great Deep are described in the Bible as a source of the devastating global flood. While some have contended that the main source of the waters was the 40 days of rain (See: canopy theory), today most creation scientists agree that it was principally caused by waters of a subterranean origin. Recent discoveries have revealed that the inner earth may hold more water than the seas. Analysis of the earth's likely composition in 2002 revealed "there may be more H2O deep underground than in all oceans, lakes, and rivers combined." In 2007, scientists discovered for the first time that a vast 'ocean' exists beneath Asia that is at least the volume of the Arctic Ocean. According to National Geographic, the water appears locked in moisture-containing rocks discovered through scanning seismic waves, but further discoveries could follow. Some who dismiss the idea of a global flood do so because they say the Flood would have had to rise as high as Mount Everest, because Genesis 7:19 says the waters covered "all the high hills." Mount Everest peaks at 29,035 feet (8850 metres), and they say there is not enough water on earth to cover such a height. This passage tells us that mountains rose and valleys sank during the Flood. Mount Everest rose up during the Flood, so the Flood did not need to reach the height that Mount Everest is today. There is enough water on earth for a global flood. If the earth was smoothed out, the water in the oceans would cover it to a depth of about 8,813 feet (2.6 kilometres). This does not include the water in rivers, lakes, glaciers, and other sources. They would add about another 2–3 thousand feet (600-900 metres). In reality, the Flood would only need to be a little over 7,000 feet (2.1 kilometres) deep. Anecdotally, if the oceans today were only 300 feet lower, every continent would be connected with land bridges. That much of the floodwater was trapped on land and in glaciers is evidenced in the massive underwater canyons located at the egress point of major rivers on every major continent. The Hudson river has just such a canyon, eclipsing the size of the Grand Canyon and would have required enormous power to carve (more power than what is delivered today by the river's egress to the ocean). So the real question is whether it is possible for Mount Everest to have risen to its current height fast enough to fit a time-scale consistent with the Flood. The earthquake that caused the Indonesian tsunami of December 26, 2004 caused an uplift of at least 20 feet (six metres) in a few minutes, which is a speed of about 240 feet per hour (84 metres per hour). At that rate Mount Everest could have reached its current height in about five days. Forces observed in earthquakes are sufficient, if extended long enough, to quickly raise the highest mountain to its current height in just a few days. Marine fossils are discovered on the highest peaks. The result is that, based on the amount of water on earth, and observed tectonic forces, there was the potential to quickly raise mountains. So the global Flood of the Bible is theoretically possible. You can see a seafloor study that traces culprits behind Indian Ocean tsunami for further explanation. Although the Genesis account of the flood of Noah has traditionally been interpreted as meaning a global event, some believe it was merely a regional catastrophe. The local flood view is held by old-earth creationists known as Day-age or Progressive creationists. Arguments in favor of this position use the original Hebrew wording, which they claim is ambiguous about whether the flood was universal. This is not true, since a unique and specific Hebrew word "mabbul" is used to for the Genesis flood, and a unique and specific Greek word "kataklusmos" (e.g. cataclysm) is used in the New Testament. Other words for "flood" are used for local floods. Local-flood advocates also cite many ancient historians who have claimed that Noah's Flood was regional. In addition, some Islamic and Greek historians recorded the flood as regional. These however, are so closely descriptive of the original Flood that they are considered derived stories. The Flood is offered in Genesis as an eyewitness account. Practically speaking, a regional flood makes nonsense of the story. The size of the ark means that its building is likely to have taken several years. That being so, it would always be simpler to migrate away from the region rather than build an ark. In addition, there would be no need to preserve animals through it, since they too could have walked to safety. No conceivable regional flood, in the earth's current configuration, could cover so wide an area as to require an ark rather than feet in order to escape it. More importantly, God promised (with a rainbow) that he would never flood the Earth with water again. There have been many local floods since that time. Even one local flood means that God broke his promise. Furthermore, John D. Morris, at the Institute for Creation Research, points out that the Hebrew and Greek words used in the Bible for the Global Flood were substantially different from any words used to describe either a local flood or a metaphor for a military invasion. Could a just God destroy innocent life? This objection refers to the many living things that were destroyed in the Flood. Why destroy the innocent animals? This is answered with an examination of the context. Mortal life, including plants and animals, since the Fall of Adam and Eve, is subject to death. Withholding a global flood would not have saved any animal or plant from death. The justice of God provided a way for many species to be saved on the Ark. God waited as long as his justice would allow, before causing a Flood that would shorten the life spans of individual creatures but would not destroy general kinds of creatures: Life would return and the earth would be repopulated. The question of "innocent animals" also presumes that the purpose of the Flood was solely to judge sin or bad behavior, neither of which were solved by the Flood. The Flood served to universally and completely cut off the physical germlines of the corrupted flesh. That is, the animals that had genetically deviated, or had been deliberately corrupted by angelic interference, would be annihilated. The animals on the Ark, specifically and personally selected by a wise Creator, would reset the animal population of the earth. In the opening verses of Genesis 6, God openly observes that all humans are wicked. God selects Noah for His own purposes and reasons, but does not claim that Noah is innocent, only that Noah is obedient and is "perfect in his generations" - that is, a highly pristine genetic specimen. Abraham queried God as to whether God would preserve Sodom if only a few righteous remained, and persistently reduced the number down to ten(10). As far as we know, this is God's threshold for withholding judgment for the sake of a righteous remnant. The Flood, however, preserved only eight(8) which like Sodom, did not meet this threshold. Later in Scripture, Jesus Christ compares his Second Coming to the Flood and to Sodom, linking the two events as analogous to "evacuation before judgment." How could you get 7 billion people from just 8 survivors of the Flood? Population growth is modeled by the equation , where is the current population, is the beginning population, is the growth rate (as a decimal), and is the amount of time over which the population has been growing. Now, let us find the growth rate required to get from 6 people 4300 years ago to 7 billion people today by solving for . Recall that this is the growth rate required if the Flood had occurred 4300 years ago, which is a late date for the Flood. However, if the Flood occurred 4500 years earlier, as believed by many Creation Scientists, then the required growth rate drops down to .47%. Could plants survive the pressure and salinity? Doubters of the flood ask how plants could survive the flood when the salinity and pressure, and lack of sunlight, would most likely kill most plants. Their argument assumes that the salinity and pressure would in fact be high. As shown above, the water level wasn't nearly as high as the present altitude of mount Everest and not as high as they'd consider, so the pressure would not be high enough to flatten trees and such as they'd think. They further assume that the water flooding the earth, had to be salt water. If it wasn't, then it would more than likely "water" the plants underneath rather than poison them. And because the water altitude wasn't nearly as high as they anticipated, sunlight filtration becomes less of a problem. Indeed, thousands of sea creatures and plants today can live in seawater at great depths with minimal sunlight, and they are submerged deeper than those flooded plants would have been. Furthermore, even if the water flooding the earth was highly saline, seeds could have easily survived—as Darwin himself proved. When the dove returned an olive branch Genesis 8:11 this strongly adds credibility to the account, considering that olive trees are one of the hardiest and resilient trees in the world, and would have rapidly grown to produce branches in a short period of time. Could the Ark hold all the animals? A scale replica of Noah's ark with pairs from various animal kinds waiting to board. One of the most frequent questions asked, as evidenced by the abundance of Creationist responses, is whether the Ark could contain all the varieties of animals we see today. Practically speaking, God personally gave Noah the dimensions of the Ark and also told Noah that the animals would come to him. In short, God knew which and how many animals he would send, and so designed an Ark suitable for it. The question remains as to the details of this preservation. Probably the best point to be made is that made by Doctors Morris and Whitcomb in The Genesis Flood (1998), that the core created "kinds" mentioned in Genesis 1:5 are not the same thing as species. This is the concept of Microevolution, which is Biblically compatible. According to Genesis 1, God told each core created animal to bring forth after their "kinds", or a scientist might call them, Family. The word "kind" is translated from the Hebrew word "miyn", defined by Strong's Hebrew Dictionary as "from an unused root meaning to portion out; a sort, i.e. species:--kind." We can see Natural Selection occur, we can see adaptation occur, but what remains highly speculatory is this belief in Macroevolution, that all species came from a common ancestor. Just because species adapt after their core species (genera) to the environment, changing to become the numerous varieties we see today, does not mean they all had a common ancestor. There would, in other words, be fewer parent species required on the Ark, which would then adapt through Microevolution into the many varieties that we see today, according to the book of Genesis. What is more, we see that this rate of Microevolution is fast enough to allow such rapid adaptation within thousands of years, as it is being discovered far faster than commonly believed under the theory of Evolution, within decades, rather than over thousands or millions of years. Could Noah repopulate the earth with the altered soil composition and available food? One persistent complaint by Flood doubters, and therefore a generally acknowledged fact on all sides, is the apparent lack of human fossils. Certainly, most of the victims of the Flood did not fossilize. Therefore their bodies decomposed, and this decomposition would have supplied the new soil with nitrogen and other vital components. Irrigation would not be a problem, because the Flood had provided plenty of water, and as discussed above, that water need not have been saline. Therefore, the surviving seeds would have been able to germinate and thus repopulate the world with all kinds of plants, including grains, fruits, and vegetables. If germination began almost immediately after the Flood, Noah and his family could live on the remaining supplies that they had not consumed aboard the Ark, and within weeks the first "voluntary crops" could have sprouted. Noah and his family would have consumed only a small fraction of these, and the rest would have gone to seed. Other animals would have helped indirectly by contributing to the nitrogen cycle through waste and death. Entire rain forests on other continents would have grown in only a few hundred years. The generations listed after Noah could have provided more than enough people to build the Tower of Babel. Would inbreeding threaten extinction for humans and lower animals? Many have asked, would inbreeding among humans after the flood not have caused the offspring of such unions to be retarded or deformed as we see today when brothers cohabitate with sisters or close kin? The answer is no. An understanding of genetics helps to clarify the matter. Briefly, in Adam's gene pool was the potential of creating all traits found in man today. Those who left the ark had a genetic makeup that was purely ideal and full of variabilty, allowing the descendants of the flood survivors to have the many traits we see today-through the process of isolation. After the Flood, Noah's three sons went out into the world in different geographic directions and isolation occurred. As generation, after generation was born, the gene pool was eventually narrowed through the process of natural selection and isolation, which eventually allowed the process of speciation to develop at a much faster speed. Thus after each generation was born, gene pool narrowing coupled with isolation from other peoples, caused the available genes to lesson and this influenced modern man's characteristics. However, because of sin, man's genes were effected and this lead to the possibilities of deformities. These two factors today, namely a smaller gene pool, and the present of bad genes causes children of close relatives to be possibly deformed in some way. More to the point, to say that an increased frequency of genetic disease would have wiped out entire populations is absurd. Millions of people today are still born with genetic diseases, because technically everyone's spouse is a cousin to some degree. Yet the human race endures. However, inbreeding could have caused a deterioration of the human species, which might help explain the shortening of the human lifespan. The same applies to animals: while some deterioration would have occurred, no credible observation, or series of observations, suggests that inbreeding has ever caused the extinction of an entire species. The conditions on the earth today are not radically different from the past. Even the amounts of C02 in the atmosphere have been measurably higher. Latest research shows that temperature and C02 are not directly related. In fact, the temperature associated with C02 is logarithmic, it reaches a certain point and stops even if C02 continues to rise. What if the world's animals are dying off? Is mankind truly responsible? The amount of waste and mayhem produced by the earth itself is far greater than anything mankind has ever, or could ever produce. But if the mass extinction is real, wouldn't this fall in-line with the Christian worldview, that the Creation is meant to be managed but is still a temporary existence. According to all we know of Scripture, the current Earth and Cosmos are not to last forever (2 Peter 3:10) but will be replaced by a new heaven and earth (Rev 21:1). The scientific community has extraordinary trouble wrapping words and definitions around the concept of "speciation". Within a given group of creatures, they cannot accurately define what is a new species or when "speciation" has formally occurred. Nor is there consensus on what a "hybrid" might be. In the case of many fish. a parent species of two other species could be mistaken for a hybrid of the two. There is no means to determine lineage because the definition of speciation is in flux. A major concept in Creation genetics is the idea that the current animal populations are spinoffs of the original created kinds. This is why the work "species" does not adequately describe them, either. As an example, a recent study of the mitochondria of 37 lines of cats, from the housecat to the jaguar to the lion and tiger, revealed that all 37 lines are descended from a common cat-mother in Asia. This is a finding that lines up with the creationist notion that a common cat-kind is the original progenitor of all cats on earth. Each type of cat we see today therefore, is a specialization of the original cat kind. Let's say the original cat population was as diverse as humans in any city in the world. Various fur colors and patterns, varying height, weight and size, etc. As the population grows, it must find food so a portion of it spins off to a new habitat. This behavior is observable in populations of all creatures. Let's say this diverse group moves into a mountainous region. The smaller cats don't do so well, nor do the larger ones. Over time the population specializes in size and color to what looks a lot like a mountain lion. We could observe the same for cats all over the world, specializing into their various habitats. This also explains why most sea creatures have little specialization, because their environment is not chaotic like the environment on dry land. This specialization is possible because of the highly adaptive genes given to the cats by their Creator. Their genes, like s Swiss-Army knife, are able to easily adapt to new climes and locales. A universal rule of adaptation however, is that each time an adaptation must occur, some adaptability is lost. As the given cat specializes into its habitat, it loses adaptability. Eventually it must go extinct when all adaptability is finally lost. This is primary reason for the aforementioned "mass extinction" of creatures and plants. They have specialized, adapted and re-adapted as necessary over many thousands of years, but the time has come for them to go extinct. They have lost adaptability over time and can no longer survive. What does this say of the notion that the animals we see today are derived from a common ancestor prior to the cats? The finches that Darwin saw on the Galapagos island had a variety of beaks, and he thought the beaks were the result of new, never-before-seen function. If he had stayed around long enough for one of the island's periodic climate swings, he would have seen a radical shift in beak shapes as the populations adapted to the food supply, and then a re-shift to another set of beak shapes when the climate event was over. This high adaptability is not "new function" but original adaptation placed in the finch's genome to help it survive such climate swings. Evolutionists look at animals today and see "new function" or for that matter, imagine "new genetic material". What they are missing is that the original progenitor of the creature had much more robust genome and ultimately gave rise to the diversity the evolutionist sees before him. In short, the creationist view starts from a pristine genome and "devolves" into adaptations through specialization - while the evolutionist starts with a "lower functioning" genome and sees higher function in the creatures around. Which explanation is better suited to describe the natural world? ↑ Morris, Henry M., The Genesis Record. Grand Rapids MI: Baker Books, 1976. p.183-184. ↑ Rare Diamond Confirms That Earth's Mantle Holds an Ocean's Worth of Water Scientific American, March 12, 2014. ↑ Huge Underground "Ocean" Found Beneath Asia National Geographic News, February 27, 2007. ↑ Inner Earth May Hold More Water Than the Seas National Geographic News, March 7, 2002. ↑ Morris, Henry M., The Genesis Record. Grand Rapids MI: Baker Books, 1976. p.170. ↑ Catastrophism vs. Uniformitarianism, All About Creation, 2002. Accessed March 9, 2008. ↑ Harder, Ben (2002, March 7). "Inner Earth May Hold More Water than the Seas." National Geographic. ↑ Than, Ker (2007, February 28). "Huge 'Ocean' Discovered Inside Earth." LiveScience. ↑ Lovett, Richard A. (2007, February 7). "Huge Underground 'Ocean' Found Beneath Asia." National Geographic. ↑ Harder, Ben (2010, November 8). "Earth Contains a Vast Amount of Water, But Scientists Are Unsure of Its Origins." Washington Post. Bryner, Jeanna (2007, October 1). "Huge Stores of Oxygen Found Deep Inside Earth." LiveScience. Krulwich, Robert (2011, June 23). "How Much Water Is There On Earth? Magellan Would Be Shocked." NPR. ↑ Haverluck, Michael F. "The Global Flood as You've Never Seen It." CNN, November 30, 2007. Accessed March 9, 2008. ↑ Harder, Ben, and Petherick, Anna. "Seafloor Study Traces Culprits Behind Indian Ocean Tsunami." National Geographic News online, December 23, 2005. Accessed March 9, 2008. ↑ Morris, John D. "'Cataclysmed' with Water." Institute for Creation Research. Accessed March 9, 2008. ↑ Slick, Matthew J. "Could Noah's Ark Hold All the Animals?" Christian Apologetics & Research Ministry. ↑ Taylor, Stanley E. & Taylor, Paul S. (2002). "Could Noah's Ark Really Hold All the Animals That Were Supposed to be Preserved From Flood?" Eden Communications. ↑ Sarfati, Jonathan D. (1997). "How Did All the Animals Fit On Noah's Ark?" Creation Ministries International. In Creation, 19(2), pp. 16–19. ↑ Mendez, Arnold C., Sr. "Was Noah's Ark Big Enough to Hold All the Animals?" BibleStudy.org. ↑ BibleTools. "Greek/Hebrew Definitions: Strong's #4327." Church of the Great God. This page was last modified on 17 May 2016, at 17:34.